As 51 Pegasi has become one of the top 100 target stars for NASA's planned Terrestrial Planet Finder (TPF), images of this star and its position relative to the Milky Way in Earth's night sky are now available from the TPF-C team. On February 19, 2006, Margaret Turnbull named 51 Pegasi as a Sun-like star that is old enough to qualify as a top-five candidate for those listening for radio signals from intelligent civilizations, such as the SETI Institute. 51 Pegasi is a yellow-orange main sequence dwarf star of spectral and luminosity type G4-5 Va, but it had been previously classified as G2-2.5 and sometimes as a subgiant (IV). 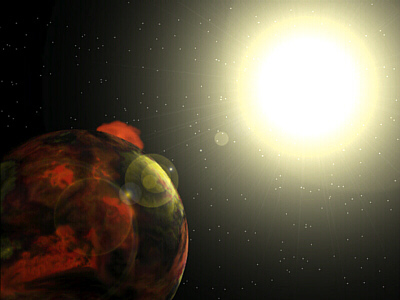 The star has about 1.06 times the mass of Sol (51 Peg at exoplanets.org), 1.15 to 1.4 times its diameter (Henry et al, 2000; and Guillot et al, 1996), and 1.30 times its visual luminosity (51 Pegasi at the Observatoire de Genève). Relatively bright and large for its spectral type and mass, it appears to be running low on core hydrogen and may be as old as 8.5 billion years old or more (Henry et al, 1997), but one analysis of isochrones suggests that the star could be a billion years younger -- at 7.5 billion years old (Guinan et al, 1999). 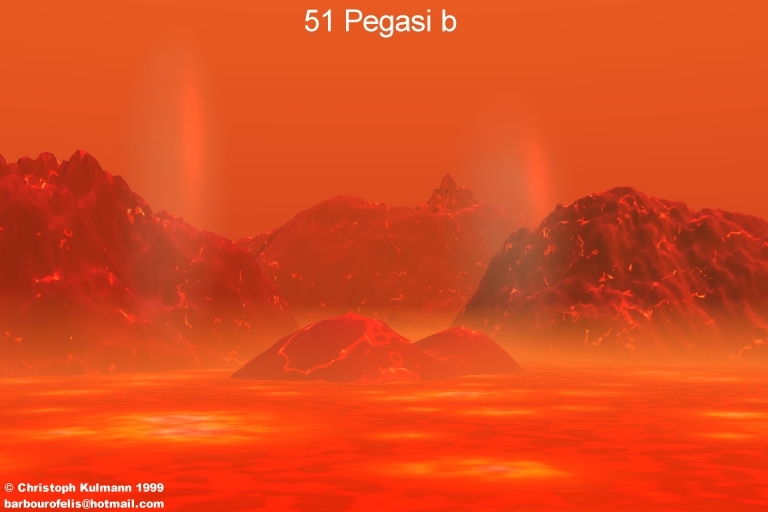 51 Pegasi is 1.6 times more enriched than Sol with elements heavier than hydrogen ("metallicity"), based on its abundance of iron (51 Peg at exoplanets.org). It is a New Suspected Variable (NSV) 14374. Useful catalogue numbers and designations for the star include: 51 Peg, HR 8729, Gl 882, Hip 113357, HD 217014, BD+19 5036, SAO 90896, and LTT 16750.
from the star), as simulated by Stimac (more). superplanet, as imagined by Whatmough. 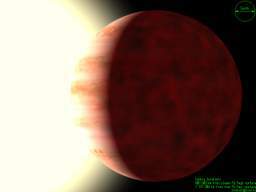 In 1995, astronomers (Michel Mayor and Didier Queloz) announced the discovery of a Jupiter-class planet around 51 Pegasi using radial-velocity methods (Mayor and Queloz, 1995; and 51 Pegasi at the Observatoire de Genève). Planet "b" has at least 46 percent of Jupiter's mass. It moves around 51 Pegasi at an average distance of only 0.05 AUs (a semi-major axis well within Mercury's orbital distance) in a highly circular orbit (e=0.03) that takes only 4.2 days to complete. Its orbit may be inclined by less than 85° from the perspective of an observer on Earth (Henry et al, 1997). Assuming a Jupiter-like composition, its radius may be about 1.2 times that of Jupiter, enlarged relative to Jupiter because of greater absorbed stellar radiation in its inner ("torch") orbit. However, the planet may be too hot to hold onto a thick hydrogen atmosphere (discussion). Recently, astronomers at the University of Texas at Arlington performed refined calculations to determine that the habitable zone around 51 Pegasi, where an inner rocky planet (with suitable mass and atmospheric gas composition and density) can have liquid water on its surface, lies between 1.20 and 2.0 AUs of the star. Unfortunately, the development of an Earth-like planet in this zone could have been disrupted since it would likely be expelled by the inward migration of planet b, as hypothesized by some planetary astronomers. 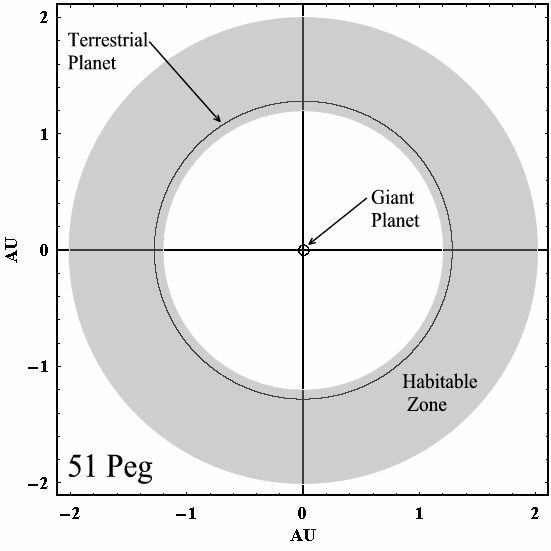 If a small, rocky planet could have developed without the interference of planet b, however, then stable orbits appear to be possible over the entire habitable zone (news release; and Noble et al, 2002, in pdf). tenth of the habitable zone distance. of planet b (news release). 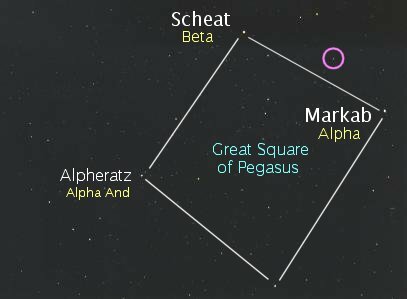 A terrestrial planet orbiting 51 Pegasi at around the center of the calculated habitable zone would have an average orbital distance of about 1.6 AU, just beyond the orbit of Mars (towards the Main Asteroid Belt) in the Solar System. It would complete this orbit within about 2.0 years. 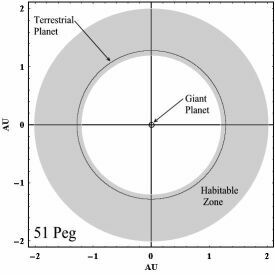 (See an animation of the planetary and potentially habitable zone orbits of this system, with a table of basic orbital and physical characteristics.) Astronomers are hoping to use NASA's Terrestrial Planet Finder (TPF) and the ESA's Darwin planned groups of observatories to search for a rocky inner planet in the so-called "habitable zone" (HZ) around 51 Pegasi. 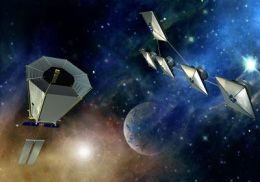 As currently planned, the TPF will include two complementary observatory groups: a visible-light coronagraph to launch around 2014; and a "formation-flying" infrared interferometer to launch before 2020, while Darwin will launch a flotilla of three mid-infrared telescopes and a fourth communications hub beginning in 2015. The following table includes all star systems known to be located within 10 light-years (ly), plus more bright stars within 10 to 20 ly, of 51 Pegasi. Try Professor Jim Kaler's Stars site for other information about 51 Pegasi at the University of Illinois' Department of Astronomy. John Whatmough also has illustrated web pages on this system in Extrasolar Visions. For another illustrated discussion, see Christoph Kulmann's web page on 51 Pegasi. Up-to-date technical summaries on this star can be found at: Jean Schneiders's Extrasolar Planets Encyclopaedia; the Astronomiches Rechen-Institut at Heidelberg's ARICNS, the Nearby Stars Database, and the Research Consortium on Nearby Stars (RECONS). Additional information may be available at Roger Wilcox's Internet Stellar Database. The "Winged Horse" is one of the larger constellations of the Northern Hemisphere. For more information about the stars and objects in this constellation and an illustration, go to Christine Kronberg's Pegasus. For an illustration, see David Haworth's Pegasus. © 1998-2006 Sol Company. All Rights Reserved.